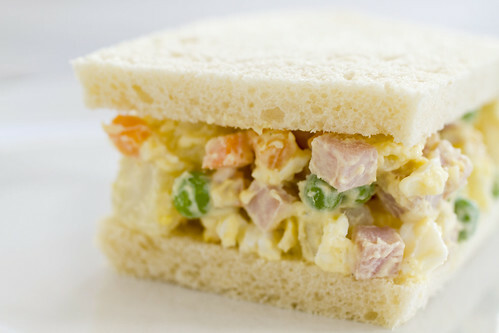 In grade school, one of my favorite packed lunches was a Potato Salad Sandwich. As a grade-schooler, I assumed that this potato salad was Chinese food because that’s what mom makes, Chinese food. It wasn’t until later that I realized that it didn’t really fit. Then, I started thinking it was just one of the few American dishes my mom knew how to make. She did make spaghetti occasionally too. Over time, I started to find that none of my American friend’s moms made potato salad this way. My friends would stare at my lunch and ask, what is that? That lead to the belief that it was just my mom’s own concoction. She has a lot of those so I thought nothing of it. I get the favorites questions a lot. What’s your favorite restaurant? What’s your favorite dish to make? What’s your favorite cuisine? I simply can’t answer a question like that. It’s like choosing a favorite child. After being asked this question for the billionth time, I sat deep in thought, on the train, trying to drown out the sounds of the obnoxious guy playing music on his ipod. (Dude, it’s called headphones!) Could I pick a favorite if I really tried? With serious effort, I still could not. Instead, I realized that I could categorize all foods into three categories (I think). Let’s say roughly 40% fall into favorites, 10% into not-so-favorite, and 50% into that middle ground. Notice that I don’t have dislikes because I really don’t. I eat everything that is considered real food and though there are a few things that I don’t order myself, I still take a bite if Lon has it on his plate. 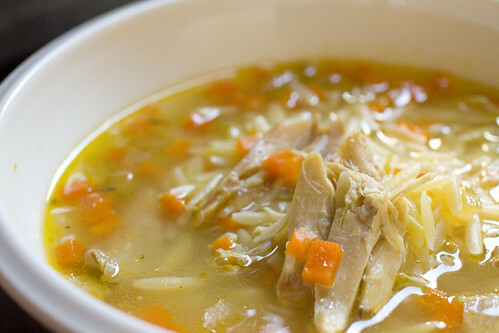 I’ve been working on this post since the beginning of winter, when I first started thinking about chicken soups. The variety of chicken soups across so many cultures is just so interesting to me. They are all different, yet share that common bond, the ability to comfort anyone, and make each of us think of home. There isn’t anything scientific in the post. I did not set out to prove or disprove anything, or even test any theories. This is not about one being better than the others. 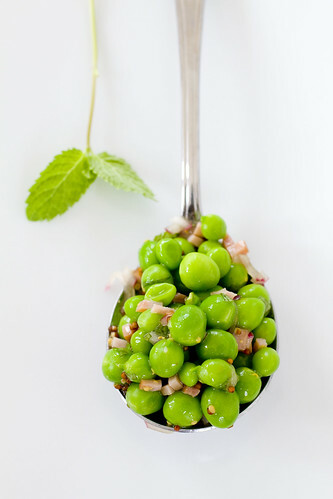 I just wanted to try several different recipes and methods, just to take notice and appreciate what each had to offer, and each one did have something special to offer. I will make all of these again, and I hope this post is useful for you each and every winter. I know several people who love breakfast foods so much, they often eat it for dinner. I also know several others who look for ways to make a heartier breakfast. 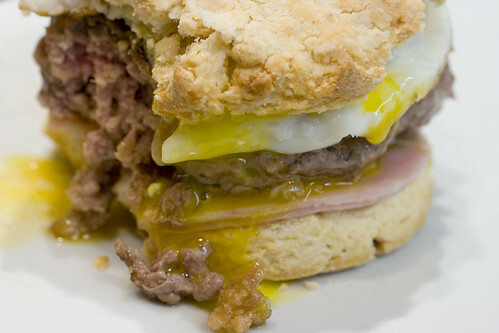 Either way, this breakfast burger satisfies at any time of day. 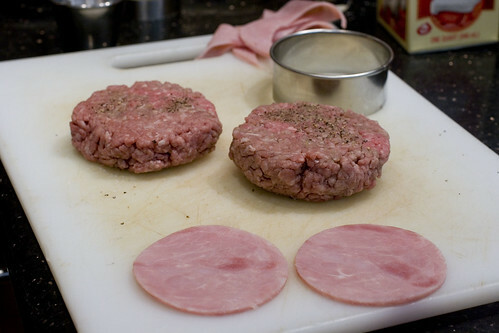 Here, I cut or mold everything into a 3″ round because I’m a silly perfectionist but you can make the burger less fussy without such tight size restrictions. 2. Cut butter and shortening into flour. Stir in 1/2 cup of heavy cream with a fork. Add up to 2 tablespoons more heavy cream in order to get the dough to stick together. Once the dough can be pushed together, flatten to a little more than 1/2″ thick on a well floured surface. 3. Cut with a 3″ circle cutter and place on un-greased cookie sheet. Push left-over dough together and cut into 3″ circles again. Bake for 14-16 minutes, or until lightly golden. 4. While biscuits are baking, cut ham with 3″ circle cutter. Set aside. 6. Heat a large flat non-stick pan with a bit of oil (or non-stick spray) over low heat. Crack the eggs, keeping them whole, into the pan, spaced out and not touching if possible (or use more than 1 pan). Do not flip. Just cook until desired doneness. Remove from to cutting board. 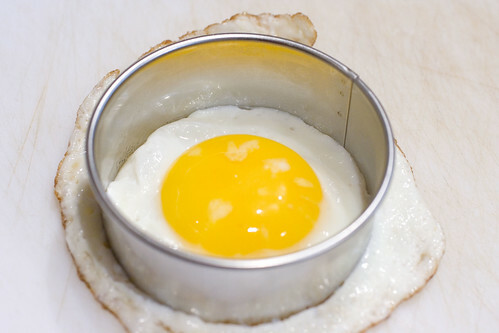 If the eggs are too big, cut with 3″ circle cutter. 7. When biscuits are done, split them in half very cautiously. 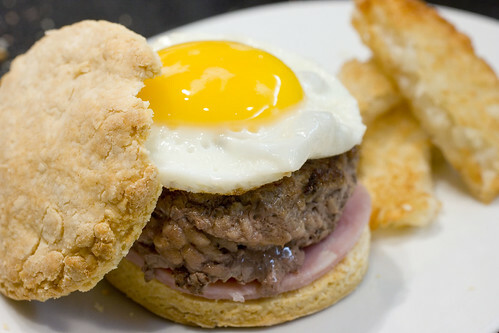 Place ham on the bottom piece, then burger patty, then egg, then biscuit top. Serve immediately.